Eminent Domain laws refer to the greater good of the citizens of the community and/or state where this law is being used. I can find no evidence that the citizens of my community will benefit from this pipeline. 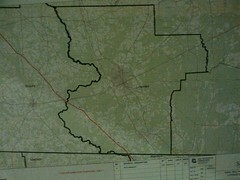 Therefore, attempts by Sabal Trail to use Georgia Eminent Domain laws are inappropriate and should be rejected. Outside of a one-time easement payment, local land owners receive no compensation for ongoing hazards and loss of property values. Local governments along with the state of Georgia will bear the cost of any emergencies/leaks/explosions that may occur. Again highlighting the fact that there are no benefits to the local community with this project. South Georgia’s greatest resource, the Floridan Aquifer from which we receive all our potable water is held in fragile karst limestone. Potential damage during construction and maintenance of this proposed pipeline could cause pollution and sinkholes. The health, safety and welfare of our local citizens clearly outweighs those of a private company in this matter. I know of no local citizens or land owners that are in support of this proposed pipeline. It is my hope that FERC will respect the wishes of our private landowners and citizens. 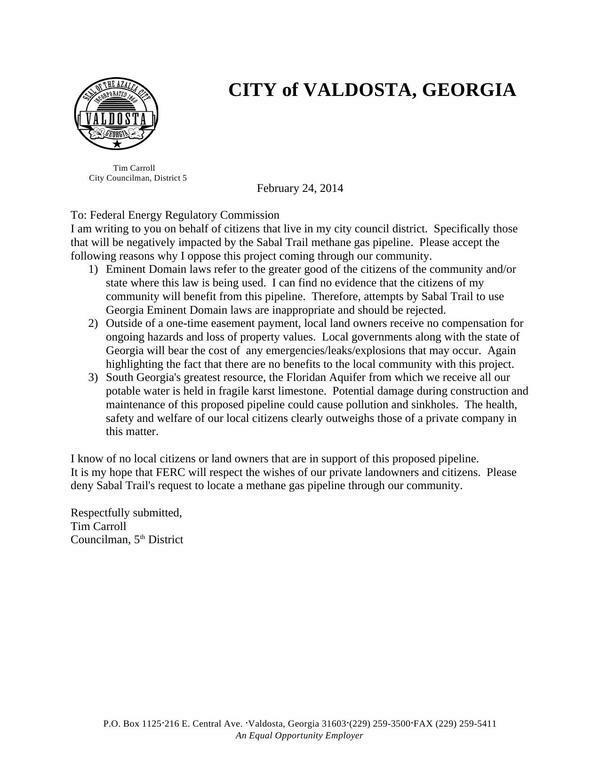 Please deny Sabal Trail’s request to locate a methane gas pipeline through our community. The sabel pipeline will be 2 miles from my house.It is dangerous if there is an explosin,the pipe is ugly and reduces the value of property,It will ruin our water system of rivers and springs if it is put under the river. it will be no value to citizens since the gas is going to be shipped overseas. After they put in the gas line they will probably frac for gas and oil.Fracking is extremely dangerous and will cause more sink holes.It will ruin our water supply. Greed Greed is the whole reason for this plan.The book stated that land owners may not even get paid if the pipe line is put on their land.If they pull out and quit using the pipes;the pipes will be sealed off and left on the land.The line will be under ground or on top of the land. They don’t care what it does to rivers and water supply as long as they get their money.They just move on for more destruction. They have to be stopped!